Now that fall is upon us and cooler temps have arrived you might be thinking less about what your grass needs and more about the fact that mowing season is over. However, your yard still needs a little TLC to prepare it for Spring growth. During this time of year, your grass is busily absorbing energy, moisture, and nutrients in preparation for a long, dormant winter. Give it a little attention now, and you’ll reap the reward of a lush, healthy spring lawn using this end of season lawn care guide. Continue to water and mow (as needed) through the fall. It may not be the most popular end of season lawn care step. But, it is necessary for spring growth. With each mowing, gradually lower your mower height until your last two cuttings without scalping the lawn. By lowering the grass height, it will allow more sunlight to reach the crown of the grass and less leaf browning in the winter. Be careful not to trim off more than one-third at a time. This time of year is ideal for soil aeration. A lawn aerator punches holes in the soil and extracts plugs of dirt that allows oxygen, water, and fertilizer to reach the roots. Some homeowners prefer to rent a lawn aerator, or you can hire a lawn care service to do it for you. Another end of season step is to remove any fallen leaves as they shed. 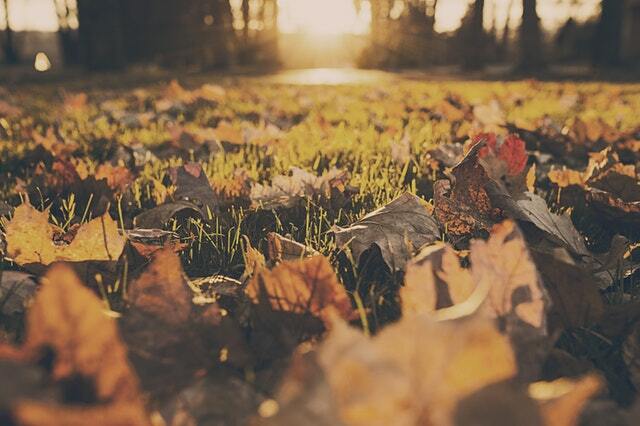 Don’t wait until all of the trees are bare to start raking the yard or using a vacuum system. If you do, the leaves become wet from rain and morning dew, stick together, and form a mat that suffocates the grass. It also breeds fungal diseases. Fall fertilization is perfect for feeding your lawn. In the fall, the grass leaves may grow slower, but the roots and rhizomes continue to grow quickly. Fall fertilization is an end of season lawn care step you don’t want to skip because this application delivers essential nutrients needed for a boost in the spring. Fill in those bald spots with a ready-to-use-grass seed mixture, a quick-starter lawn fertilizer, and organic mulch. Loosen the soil with a garden rake, spread a thick layer of the mixture over the area, lightly compact, and water thoroughly every other day for two weeks. End of season lawn care doesn’t have to be a chore. Leave it to the professionals! Nichols Reliable Lawn Care provides end of season lawn care and landscaping services in the Fayetteville, Arkansas and Springdale, Arkansas area. We offer a wide range of services and look forward to being your lawn care service.